Its not common but occasionally there's someone who knows his stuff when it comes to fighting but also has the bigger view of how it can be passed on to others. We've known a lot of fighters in our life and John Ottenberg has something special. His movements are extremely soft but his punch packs a wallop like you wouldn't want to feel. He's a fighter who teaches his students to think and to utilize sophisticated and proven principles. His approach, at first blush, is totally self defense oriented but stick around and there's something more, something that follows the deepest principles of martial practice. His words: "In the beginning we teach you the foundational concepts that will give you the power to take on the biggest attacker and break him down. There are no secret moves, let me repeat that, there are no such thing as secret moves, especially ones that your government doesn’t want you to know, as claimed by some sites. All of the movements taught come from many different martial arts systems, where do you think the information came from in the first place, we’re the ones that taught the government." 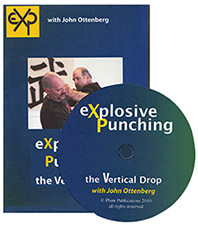 eXplosive Punching is the catch-all name for a dynamic martial self defense method. Firmly based in classical martial arts, it reverses the normal process of teaching and builds up the traditonal skills in exactly the way they were created: a step-by-step progression, from what works to what works while adding sophistication and creativity as it goes. It all lies within Ottenberg’s three-step approach to Motion, Movement and Technique, teaching the inner workings of a method developed from his experiences as a fighter, a soldier and an “indoor student” under one of the 20th century’s greatest self-defense instructors. 1. You start with an immediate improvement of your punching. Within a few hours of practice you will punch harder and better than you have in your life. 2. You memorize NOTHING; no tricks, no movements, no “techniques”. Nothing. In this method you don’t try to use anything unless it is bone deep. 3. You learn all there is to punching, then go beyond that to master even more complex and devastating actions. 4. From the moment you begin you are exposed to ideas normally reserved for black belts. You are taught not only to customize to your own body but to think for yourself. 5. Every step you learn is complete onto itself. Not only can you use it, but it seamlessly leads to the next step in your training. Note: One word of advice: John's technique is highly refined, so much to as to appear casual. You will have to actually try these motions to understand the level of sophistication involved. This dvd, produced by Plum Publications, was the first exposition of John Ottenberg's concepts on tape. This is the original tape converted to DVD without chapters. It's a little rough but you will see John's basics premise of the Motion-Movement and Technique and its radical implication for streamlining self defense. This was originally developed to target the schools that say they teach self defense, but fall short of the mark. Even though it is curriculum oriented, it's teaching foundation is comprised of adaptable fighting material. The material here is thick with possibilities. Note: One word or advice, John's technique is highly refined so much to as to appear casual. You will have to actually try these motions to understand the level of sophistication involved. This base level dvd takes the guesswork out of what works. No longer do you need to memorize techniques, simple everyday movements become lethal responses, taking down even the biggest attacker. It's not about knowing how to fight, it's about fighting right. Note: John has been teaching a long time and is a top notch instructor. He's still new to the video process and his ideas come so thick and fast that he can barely finish one sentence before elucidating the next concept. If you take the time to work with what he's presented here it will be well worth it. At first blush it appears to be a very macho hard edged series of almost kick boxing techniques. Nothing could be further from the truth. John's technique is very subtle and mechanically sound. He starts with punching to protect people's fingers. Then, when he introduces his self protection system he has already set up all that's needed to generalize to other situations. It's so simple and effective it can slide right by you if you blink. We've seen John in action and highly regard his work. John Ottenberg knows what he's talking about. A personal student of the world famous teacher "Mr. Tino" Tuiolosega - the originator of Lima Lama - John has absorbed self defense training of the highest order. A fifth degree black and a man of real fighting experience, John has knocked around for over thirty years in the martial arts. His experience, insight and intelligent instruction shows a wise range of thought and technical expertise. You may well ask why a Kung Fu/Tai Chi site would sell these DVD's. Very simple. We know John very well and have seen him move. While there's not doubt that his base style, LimaLama, has many concepts and movements from Chinese martial arts John himself in execution is fluid, smooth, tremendously efficient. What he specializes in partakes of key concepts shared with the most sophisticated martial styles . In this breakthrough video, 5th degree Black Belt in LimaLama, John Ottenberg turns the entire process of learning self defense on its head. Starting with one basic motion, he demonstrates a whole range of defensive technique adaptable instantaneously. Ottenberg was a personal student of the world famous "Mr. Self Defense", Grandmaster Tino Tuiolosega. Here he presents his own unique insights into the study of self defense. Foremost among these is his concept of MotionMovementTechnique. In a packed hour of information this rich video will forever change your view of self defense. Combining lectures, instruction and examples, this tape contains months of training material. And, importantly, every idea is immediately applicable to anyone's self defense training. These core concepts will revitalize all those techniques you've studied and give you what John calls "A Master Key" to their application in reality. The techniques in this video start simple but advance to cover all the major considerations of self defense training. With a seemingly almost casual motion of the hands John develops a self defense approach that can bring new life to techniques that have become mechanical and stale. 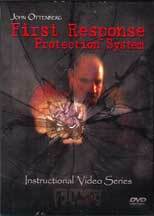 This dvd shows a very down to earth approach to self defense. John starts with punching because it's the easiest and safest way to get his concepts. Then he applies the same motions to a variety of self defense situations. His method is to take natural movements and generalize them to a variety of situations.